Today I traveled back in time through The Detroit Free Press of March 15, 1964. The issue featured a banner headline “How Dallas Jury Reached Verdict of Death for Ruby” in which “…the four women and eight men jurors reached the decision — one of four possible verdicts open to them — after just two hours and 20 minutes of deliberation…”. 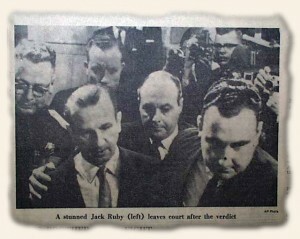 Ruby was on trial for shooting to death Lee Harvey Oswald, who killed President John F. Kennedy. Ruby did appeal the case but died from a pulmonary embolism as the date for his new trial was being set. Just a few weeks prior, Cassius Clay had defeated Sonny Liston in the world heavy weight boxing match. “‘Cassius X’ Says He’s a ‘Prophet'” said “…his Muslim name is ‘Muhammad Ali and I’m a true follower of Elijah Muhammad. I face east five times a day…”. This is when he started using Muhammad Ali as his known name. And just for fun, “Happiness is a 40-ft. Beatle”… yeah, yeah, yeah!! !